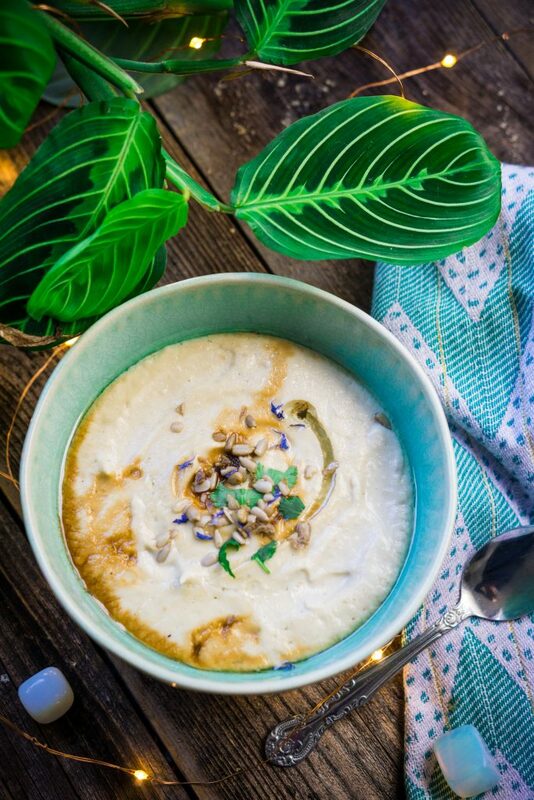 Creamy Cauliflower & Sunflower Seed Blended Soup is a recipe I have been making for years. It’s the perfect cozy day kind of soup. Where you just need something light, delicious, and nourishing. 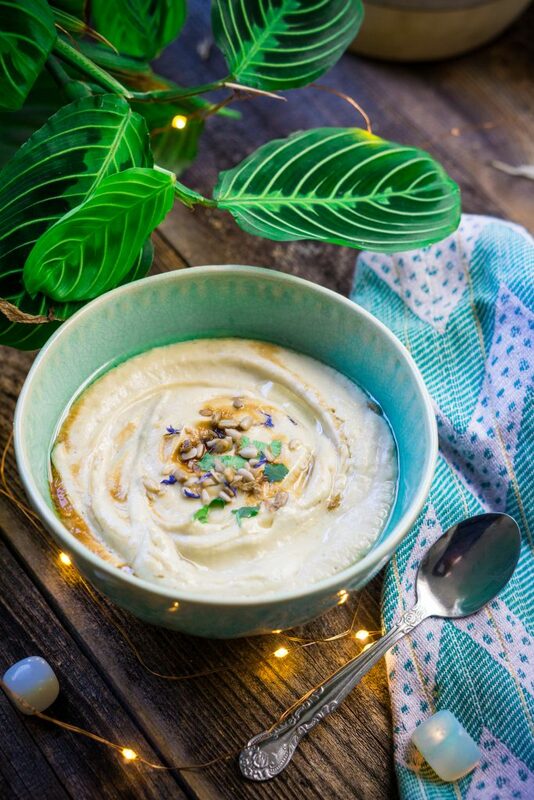 The cauliflower makes it so creamy, and the sunflower seeds add even more decadence. It’s savory, garlicky, and immune boosting. This soup is also great to make on night and weekends for dinner. The sunflower seeds in this recipe make the soup extra rich & decadent. I always pour myself more than I need for this, it’s so so filling, and will have your guests or yourself begging you to make it again for them. You can always switch out the sunflower seed for balanced almonds, pumpkin seeds, or cashews if they agree with your stomach. I have started to get into seed syncing to help regulate my cycle and boost progesterone levels, therefore if you are doing the same, you can switch out the pumpkin seeds for the first 1-14 days of your cycle for sunflower seeds the last 14-29 days. I highly recommend you add more seeds to the top of the finished blended soup for an extra crunch. Besides I heard eating the seeds in full form gives you the full benefits of seed cycling. If you happen to have a sensitive digestive system I recommend “sprouting” your nuts or seeds, aka soak them overnight and rinse them when you are ready to make your soap. Have you tried the waffles yet? they are literally our favorite recipe from the blog. We make a new batch every 1-2 weeks and use them waffles as bread, therefore we keep them savory. Trust me you won’t turn back once you have tried them! In a saucepan, heat the oil over medium heat to sauté the garlic, leeks, and 1/4 teaspoon of salt until the vegetables are tender. Add the cauliflower and sauté for a couple minutes. Add your broth of choice, increase the heat to high, and bring just to a boil. Cover the pot and reduce the heat to medium and simmer for 20 to 30 minutes, until the cauliflower is completely soft. Turn off the heat to allow the soup to cool slightly; stir in the sunflower seeds. Pour the soup into your blender in batches and turn it on high until smooth and creamy. Return the soup to the saucepan and warm it over low heat. Stir in salt or tamari to taste. 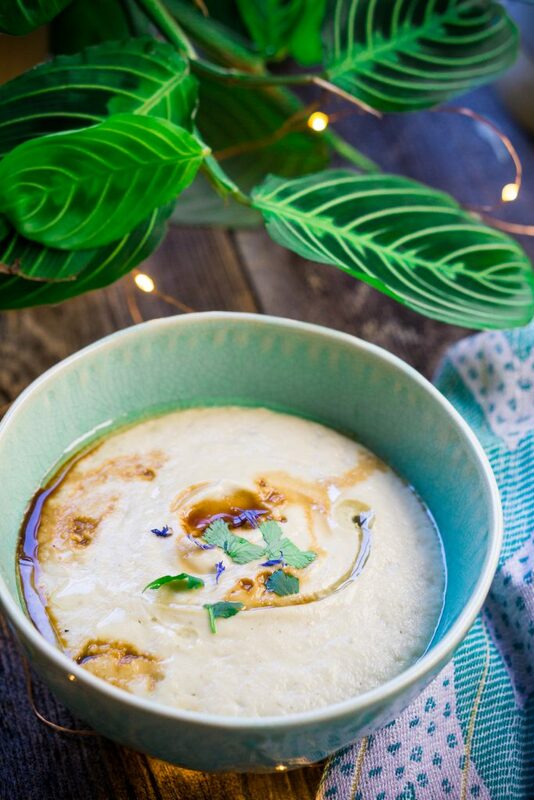 To serve, ladle the soup into bowls and garnish with either cilantro, chives, sunflower seeds or avocado.